With the beginning of Pahela Falgun, nature gets a new momentum and a lease of life. Spring comes with the starting of Pahela Falgun. It is the day to say goodbye to the winter and hello to the spring on the first day of the Bangla month of Falgun. It is the day painted with bright colours and joyous tunes all around. 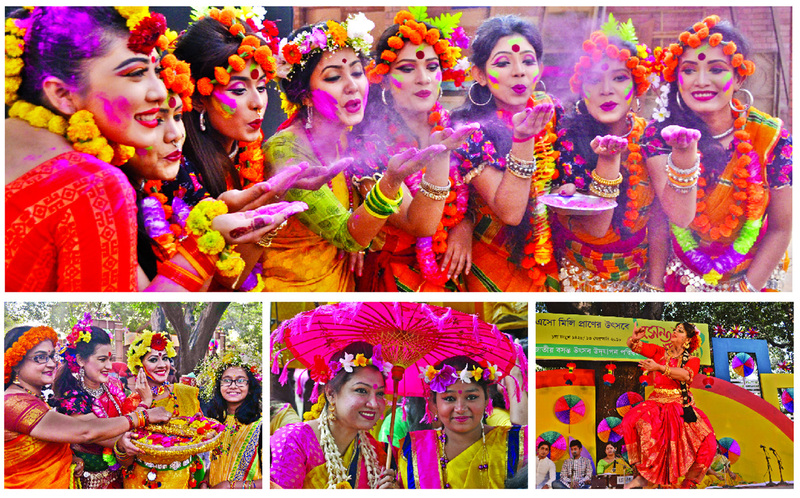 With Pahela Falgun ushering in the season of Spring in a display of colours, the country on February 13 observed Boshonto Utshab with flowers, poems and songs as the seasonal cycle is in transition from a bone-chilling, gloomy winter to the festivity of colours and love. Flowers, of red, yellow and orange colours, seem to be wheat women would like to wear in their hair. The city dwellers hail the season with joys and melodies. It's a day painted with bright colours and joyous tunes in the air. In fact, yellow, orange and red seem to be the colours of choice for the women with flowers in their hair. Dhaka, especially the Dhaka University vicinity, took a festive look. Colourful rallies and cultural programmes welcomed Boshonto (Spring) and the sprouting of fresh leaves on trees, blossoming flowers and the songs of cuckoo herald the festive season. On the first day of Spring, Jatiyo Boshonto Utshab Udjapon Parishad held a day-long programmes at four different venues - Bakultala of Charukala (Faculty of Fine Arts, University of Dhaka), Rabindra Sarobar of Dhanmondi, Bahadur Shah Park of Lakshmibazar and open stage of Rabindra Smarani, Uttara in Dhaka on February 13.